While dealing with weather variability has always been a source of stress for farmers, a generally warmer, wetter climate with the potential for increasingly intensive precipitation poses a threat to long-term farm viability. Knowing how farmers think about increasingly variable weather patterns (IVWP) is important for educators, agency staff, and others to learn how to work with producers on adaptation strategies to protect natural resources and prevent crop failure. In 2011, the University of Maine Cooperative Extension conducted focus group sessions with farmers from seven different commodity groups, five mixed farmer sessions, and two sessions with consultants, educators, and agency staff who work with growers to learn about grower perceptions of environmental changes, and to learn about changes they may be making to their farming operations to protect their operations from IVWP. Farmers discussed over 40 practices that could be construed as adaptation measures to buffer against IVWP. Fruit (apple and blueberry) growers spent the most time on the subject and expressed the most concern about the effects of IVWP, while dairy and potato growers spent the least. 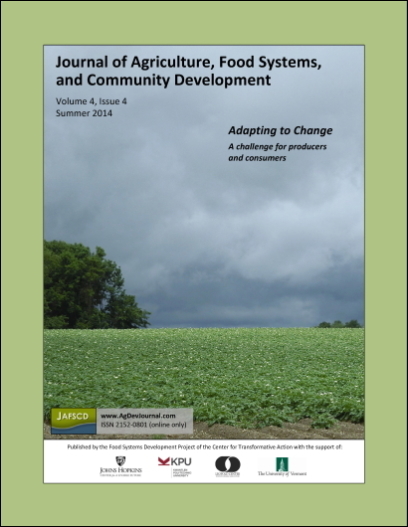 Given the divergence of opinion on the subject of climate change that Maine growers expressed, successful outreach education through the U.S. Department of Agriculture (USDA) and Cooperative Extension should likely emphasize short-term risk management, resilience, and stability of farm operations as opposed to communicating the need to adopt strategies based on climate change. 495 College Avenue; University of Maine; Orono, Maine 04473 USA. Sustainability Solutions Initiative, The Margaret Chase Smith Center for Public Policy; University of Maine; 5784 York Complex #4, Room 211; Orono, Maine 04469-5784 USA. Maine Business School, DPC Corbett Building, Room 315; University of Maine; Orono, Maine 04469 USA. 5741 Libby Hall; University of Maine; Orono, Maine 04473 USA.